There aren't many opportunities to be this close to dresses like these (!!!!). 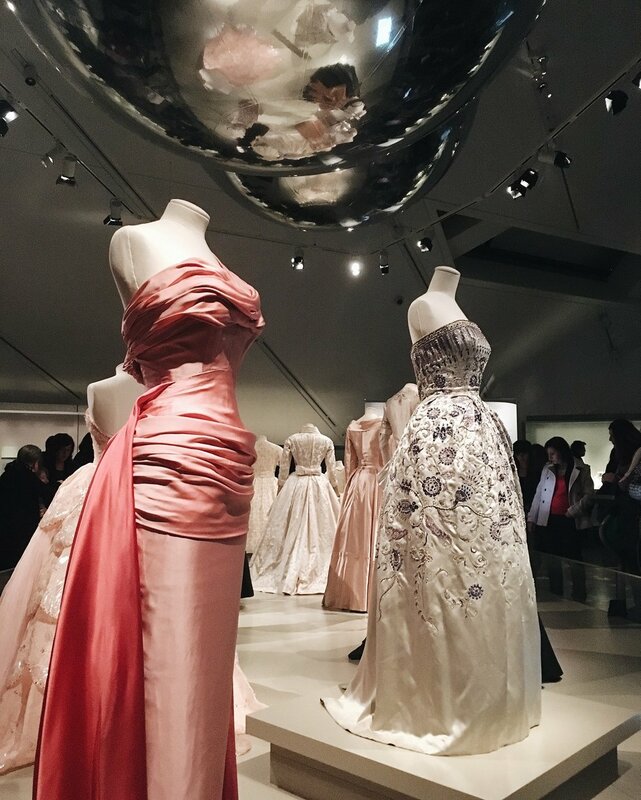 The Dior Exhibit at the Royal Ontario Museum in Downtown Toronto was worth the visit and all the hype it received on everyone's social media. The exhibit space was small and dark allowing for the dresses and glass cases to be dramatically lit, highlighting their impressive sparkly details and craftsmanship. Walking through the space we got to see Christian Dior's process work with all of his notebooks, fabric swatches and prototypes. The embroidery swatches were from the oldest still operating luxury embroidery company in the world! The Dior new look dresses with full skirts from post WWII were my favourites. You could see how much thought was put into each part of each piece. Dior taught his army of seamstresses long forgotten traditional methods of dress construction to make well-fitting, comfortable, quality dresses and suits for women and girls for day and evening wear. To top it off there were countless elegant and extravagant perfume bottles and necklaces that I can't imagine owning because, gosh, who knows how expensive they would be.... They did remind me though of being little and waiting for my dad to come back from his business trips to Paris. He would always be sure to bring me back tiny sample bottles of Dior perfumes as a keepsake to make me feel a teensy bit fancy. I recently wrote a paper for my Fashion Industry class about fast fashion and if I wasn't already an advocate for reusing clothing and a lover of the handmade, I definitely am even more so after researching for and writing that paper. It seems that people are having less of a relationship with their belongings, buying mass amounts of cheap clothing without appreciating or realizing the resources and work that goes into each piece of clothing or accessory and disposing of perfectly good items at their trend expiration date rather than when they're truly no longer useful. I won't rant about how sad this makes me a whole tonne... but if you want to read more about this you can read my paper here. What on earth is slow fashion?! I myself hadn't really heard the term until quite recently when I saw that many of my favourite creators / makers on Instagram were using the hashtag and some are taking part in "Slow Fashion October". Slow fashion is basically the opposite of fast fashion. Its the idea that we should build a connection with our clothes, understand and appreciate where they come from and take time to invest in clothing we believe in. I've been a HUGE fan of Dayna's for years now, falling in love with her hand-embroidered, tie dyed pieces when she went by her original name "The Art Swallow".She started when she was in high school with a friend, Janelle Bellamy, selling at craft shows and eventually started an etsy shop. Dayna started by making mainly jewelry and handmade stuffed animals out of old sweaters. "We loved the idea of having a reason to be creating things, and that by selling online, people all over the country could enjoy the things we were making!" Dayna's brand and image has changed quite a bit in the last few years so she now goes solo by the name of "Solstice Handmade". "Slow fashion, especially when it incorporates natural elements or colors, is about forming a connection to a piece of clothing. knowing where a garment came from and how it was made helps you to form a deeper connection to it. I especially enjoy the way that natural color can reference memory. If you're a person that recognizes and appreciates the plants that bloom over the seasons, when you see them on your clothing, they can call to mind certain feelings and experiences-for example goldenrod always evokes anticipation for me, of school starting and seasons changing." Dayna loves to work with cotton or linen most often because they're soft and they take to her hand dyeing fantastically. "They also in my opinion are much more casual than silk or wool would be, which is appealing to me." Her work mostly consists of embellishing and altering clothing by hand. She says "I've dabbled a bit in making my own clothing because I like the control you have over the garment. A lot of my other work consists of printing, embroidering, and altering blank clothing that I purchase, but it feels constricting after awhile. The feeling that you've made something entirely with your hands from simply materials is pretty darn satisfying". Dayna's business goals are simple: "to support myself by using the skills I had to make people things that they wanted at a reasonable price point. I don't want anyone to see something that they connect with and would like to own, and not be able to because of an unfair price. I've started focusing on wearables more as I picked up skills and techniques like screen printing and block printing from friends and school." "Natural dyeing is surprisingly simple! simmer plant material in water for an hour, strain the dye, and add your fiber. There are several ways of treating your material to alter the color, this process is called mordanting. Alum is most commonly used to brighten colors, iron is used to "sadden" hues- it turns golds to olives and oranges to rich browns. My goal in the future is to incorporate more natural color into my artwork, I'm starting to experiment with making printmaking inks!" Dayna says she is now trying to find ways that she can use her artwork to help environmental institutions fundraise to help with conservation projects. "The jackets in the photos above were sewn from thrifted cotton bedsheets and coloured with seasonal plants gathered at pierce cedar creek institute of southwest Michigan. The emerald green jacket was patterned with shibori, similar to tie dye, and coloured with a weak bath of indigo over bright yellow goldenrod. The jacket that the dark haired girl is wearing is eco printed. Eco printing is a process of tightly bundling leaves and flowers on fabric, then steaming or boiling the bundles so that the plants will leave their impressions." If you'd like more specific information about natural dyeing from Dayna go here. I found Grace a little more recently, but I immediately was impressed with how creatively and beautifully she repurposes old clothing into revived stylish pieces! She shares inspiring ideas and detailed peeks into her design/creation process for all of her garments. I find myself being pulled into slow fashion culture by her instagram posts and wanting to learn how to sew so I can better repurpose my own things! Grace shared a little about herself, her shop Bread & Butter Studio and her love for creating sustainable / handmade fashion and homewares. She works with a wide array of media from hand-dyed fabrics to ink drawings. Grace is a fibre artist and illustrator living and working Chicago, Illinois. Grace has been online for almost ten years but Bread & Butter Studio is her first solo venture. It's only 7 months old but its already filled with beautiful things handmade of preloved or self crafted materials! "The name is a sort of manifestation- one day I would like my making to be my bread and butter" Grace says. "To me, Slow Fashion is all about intention. Taking a good, deep look at the impact your clothing is having on the greater world. Personally that manifests in shopping second hand, using repurposed fabric when I sew myself clothing, and supporting independent makers with intentional practices whenever I can. It doesn't mean I never buy new, from large labels, but I hold that as a last resort! 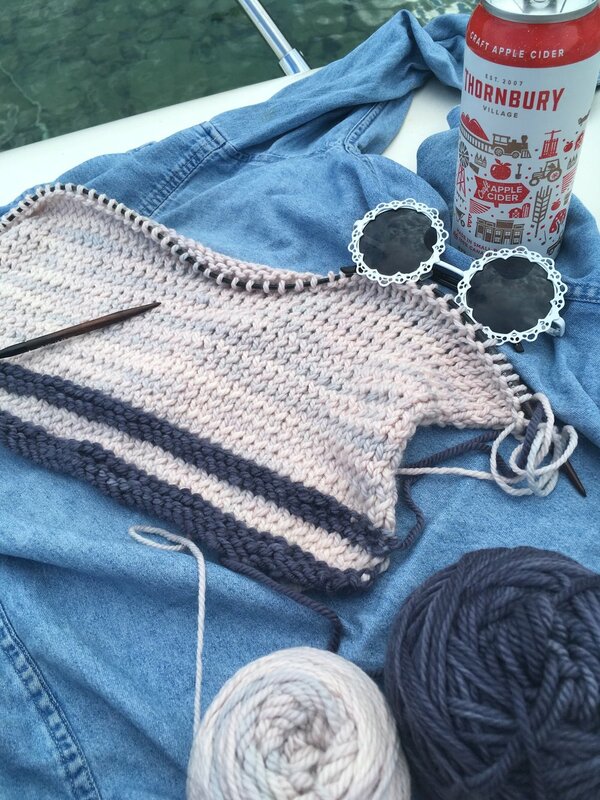 One of my favorite slow fashion hashtags is #makealtermend, which is a great mantra." Grace loves to work with linen, wool and silk, and often with boiled (or felted) wool, faded linen and broken silk. She says "there is something about natural fibres that cannot be replicated in synthetics." She creates new, re-imagined forms out of second hand materials. Grace uses second materials "because they're readily available and affordable." Her reasoning for enjoying re-use is interesting too. "I enjoy the added process of "harvesting" fabric and I think often about the lives my materials had before I started working with them. It's better for the environment, but it's also just a more interesting story that goes along with each piece I make" says Grace. Grace tells me she started making her own clothing to "fill in the gaps in [her] wardrobe that thrifting wasn't filling." She says it wasn't easy from the start though because "it took a long time to get up the skill and patience to make clothing that is both practical and attractive". How cool is it that Grace's "handmade clothing is slowly replacing ready-made in [her] closet"?! I think that would be so so satisfying. Maybe someday I can do this too! Like Dayna, Grace also loves to hand-dye with non-toxic dyes. She calls herself an amateur dyer but her results are gorgeousss. Grace grew a dye garden and dyed a rainbow of yarns, which she knit up into a big shawl. "I still wear it- my girlfriend calls it The Veggie Straw Shawl. I dream of someday having an outdoor space where I could dye and keep vats of things and grow another dye garden. But for now I have an indigo vat in our storage area in the basement, and a freezer full of black walnuts and avocado pits." Vaux Shop- their curated style is incredible. Field Day Wearables makes the most beautiful dresses from deadstock fabric- I was lucky enough to trade for one last year and it is a beloved favorite object. I just treated myself to a jumpsuit from Big Bud Press, which is impeccably made from military grade cotton. I never want to take it off. (@izzy______ on IG) is my fashion passion friend- I often make things with her in mind and that yields my best outcomes. Bella has been featured a few times on The Little Sea because she has been a close friend and inspiration to me since the high school. Bella's always had an understated chicness and an I-can-do-whatever-I-put-my-mind-to-in-my-own-way attitude. How many people have that at 19... I don't know too many! Her handmade- unique and comfy clothes now have a brick and mortar location in Cambridge, Ontario at Foxglove Studios. She loves to work with natural fibres and started making her own clothes because she wanted to put her own spin on what she was wearing. She says, "As I got older I learned more about the garment industry and it was just a no brainer to buy into fast fashion less and to give the clothes I already had a longer life by reconstructing them!" "I don't think the garment industry is something that most people think about despite the fact that we all play a huge role in the process of fast or slow fashion as consumers. I think that as with most issues, the first step towards a solution is to talk more about positive change. We don't need to necessarily boycott certain brands completely and look down on consumers who are buying into fast fashion, rather we need to make more noise about brands that are focusing on sustainability. As a retailer, I feel responsible for doing research on behalf of my customers. Some people may be buying my clothes because they want to make an ethical purchase but most are buying them simply because they like them and if they can learn a bit more about sustainability from my products then I consider that to be a step in the right direction." Slow fashion is a mixed bag of creating from scratch and repurposing. Bella says "half of the garments I produce are made from scratch and the other half have been repurposed from pre-existing garments and other textiles." Bella is queen of making washed out denim and out of date blouses fashionable again with new pockets and embellishments (see below!). She also creates a lot of one-of-a-kind pieces by altering vintage patterns and using them with modern fabrics or creating modern silhouettes. "I have an old sweatshirt pattern from the 80's that I've used to make anything from a cropped t-shirt to a cocktail dress." As mentioned before, Bella started "bvd." near the end of high school. She was making a lot of her own clothes and her original handmade pieces were showcased in the school fashion show. "From there the client base of people I knew snowballed pretty quickly but the brand's still a baby. I'm happy with how organically it's been growing." Bvd. now has a physical home in a brick and mortar location in Galt, Ontario as part of Fox Glove Studios but she still loves to keep close relationships with her clients and do custom work for weddings and events. Bella says, "learning more about sustainability in the garment industry has made me conscious of applying these same ideas to interiors." Before buying anything new for her home, her family sees if there's anything they already have that could be reimagined into a table, a centrepiece or a pillow. "I use a lot of textiles that I don't end up using in my clothing designs for things like curtains and pillows, etc.. I also buy a lot of pieces second hand at thrift stores or small antique markets, modifying them sometimes to get the look I want." She hopes to merge interior fashions into her brand someday as well. "Stella McCartney is probably my biggest inspiration in the industry. She covers all of the bases for me as a role model. I don't think there are very many designers in the luxury space who are holding sustainability at equal value to fashion like she is." Fashion past seems to be fashion future, or at least I sure hope it is! More and more people are appreciating and getting involved in the handmade like these three amazing women! More to come on handmade goods and fashion soon as I head out to Toronto's One of a Kind Show tomorrow morning! This gorgeous dress was handmade for me by my very talented young friend Bella Viglianti for my birthday! She made this dress custom for me knowing that I have a weakness for pale yellow (well - all shades of yellow really) and thrifted these amazing vintage Oscar de la Renta pumps! She even found them in a tiny size 5 no less! Safe to say she’s a miracle worker. Bella works out of her home studio in Cambridge, Ontario, hand-making special request pieces, stunning seasonal attire and altering clients’ formal wear to fit them even better.